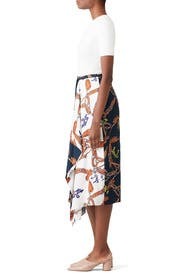 A lavish print colors this sweeping Tibi skirt cut with an asymmetrical ruffle. Navy and white printed satin (100% Silk). Skirt. Hidden side zipper with hook-and-eye closure. Side pockets. Partially lined. 32" from waist to shortest hemline; 37" from waist to longest hemline. Imported. Beautiful silk skirt. 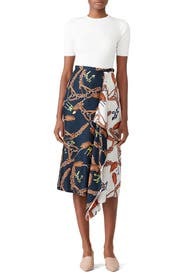 Loved the midi length and interesting print. Got tons of compliments all day! Great work office to out. 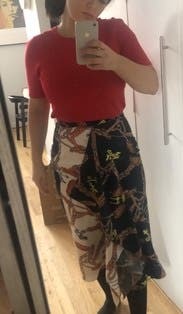 Such a fun and unique skirt! The nautical pattern is very cool, a nice addition to a summer/fall wardrobe. Definitely agree with the other comments about the need to go a size up. 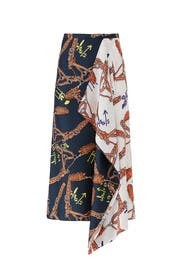 This skirt is just beautiful - the silk fabric drapes perfectly. The fit is true to size, maybe a little on the smaller side. I'm between a 10 and 12 in pants/skirts and the 12 was just the right size. Absolutely gorgeous. Fits nicely and the pattern reminds me of the buckle motif used by Hermès !! This was a bit difficult to match a top to, but I happened to find something just perfect in my closet. Silk lays really nicely on the body. Wrinkles a bit at the middle if you have been sitting all day at a desk like me. Unfortunately the skirt did not fit me. Unfortunately this was too small but I really like the print of it. Got lots of compliments. Loved this skirt. Super flattering. Fun Friday print for the office. Was quite staticy, but couldn't tell because of the draping. Has an oddly placed (under the drop) pocket that I could place a cell phone in and no one noticed! Rented this for work (via Unlimited) and received so many compliments! It's pretty lightweight so I wouldn't recommend wearing it in the dead of winter...but on those days where it's just somewhat crisp, it's perfect! Was so tempted to buy this one! As expected fit since I own other Tibi pieces. Rented this for work and date night. The print is gorgeous. The material is light and flows well. The one complaint I have is the pleating is a little different and I don't like the pocket placement. However, this does not take away from the skirt or the overall look. I wore this to work and had so many compliments. It was too big so I had to pin it, but I wore it with a white top. Material is gorgeous, not very stretchy, but runs true to size. 12 was all that was available on my unlimited subscription. 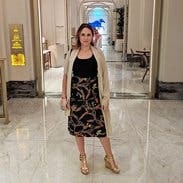 I wore this with a crop top out to a nice dinner and loved the way I looked and felt in it. This skirt is very beautiful, but very tiny. I usually wear a 6 or an 8 in Tibi and the 8 is very tight. Definitely go up a size further, I should have ordered a 10. It's long and would probably look better on someone taller, but I still liked it! Funky but conservative enough for work! 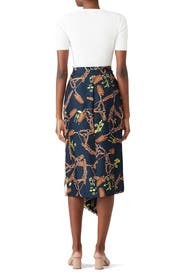 This is my new favorite skirt that I actually may have to buy. It is unique and funky but still conservative enough for a professional office environment. I got tons of compliments the first day I wore it! 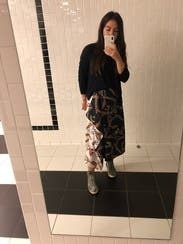 Unlike other reviewers, I didn't find that this skirt ran small; however, if you have short legs this skirt may be very long. 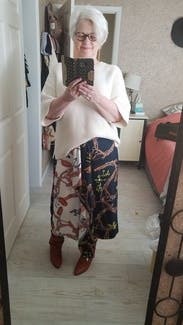 I wear a 36" inseam and the ruffle on this skirt fell slightly past mid shin. Petite people may end up with the ruffle dragging on the ground! Tight in the waist but very flattering elsewhere. Greats skirt to pear with a white tank or sweater. Fits very true to size. Wrinkles a tad too easily but that's a small price to pay for real silk. nice print goes with a lot of separates. easy to dress up or down. Probably my favorite item I've ever rented! Wow this skirt is so beautiful! I ordered a 6 because it was all that was available, probably could have done a 4 but god it's so cute, may just have to buy this bad boy! Fit great, a little clingy but few wrinkles. Wore it with half tucked j crew sweater and my reike boots. 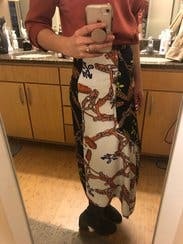 It is very stylish and I received lots of compliments. I would rent again. I enjoyed it. Material is very soft and nice drap. Perfect fit. Elegant for work and day time cocktail party. Wore so many times -- just be careful on a windy day because the split in the skirt goes all the way up!